Meet Robin Lauersdorf, a Wisconsin artist, who Tom and I met years ago at an art festival. He creates graphite pencil drawings with a realistic quality and artistic elegance. For many artists, drawing is used only as a preliminary means to an end. In his work, he has shown that pencil can be an art form in itself. Using close observation, he renders graphite pencil drawings as detailed and realistic as possible. Without the use of color, his drawings must stand on design and value alone. As opposed to pen and ink, graphite pencil allows him to obtain subtle values ranging from very light to very dark. Unlike charcoal, graphite allows for the fine details that help his art mimic reality. His design process can take longer than the drawing itself. Like most artists, he has a vision of what he wants to create and must research, photograph, and sketch until he has illustrated what he envisioned. Because of the level of detail he tries to achieve, it can take him as long as three months of meticulous work to complete a drawing. 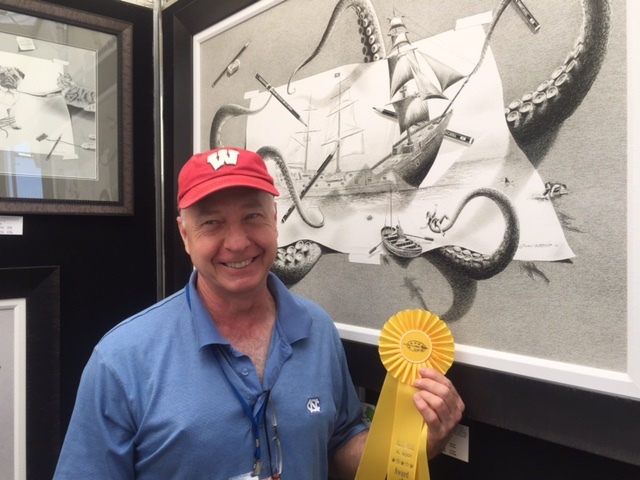 Congratulations to Robin for the award he won at ArtFest! Check out his amazing work by clicking here.